Welcome to the Art School forums. And you aren't alone. Marc has a ridiculous amount of material in these classes so make sure that you stay with it, I look forward to seeing your progress. I'm averaging around 1 complete set per 30min (5 heads). 2 hours a day will yield around 4 sets of heads (20 heads). Assuming I keep the same pace or get quicker I'll have them done in 12 days or less. After that I'll move on to the jaw. I kind of want to drag things out a bit, I could go ham and draw like a mfker and finish 50 ugly headshapes in one day but I'm not sure how much would actually stick in terms of... muscle memory maybe? I'm struggling with circles, so the heads look a bit off right now. 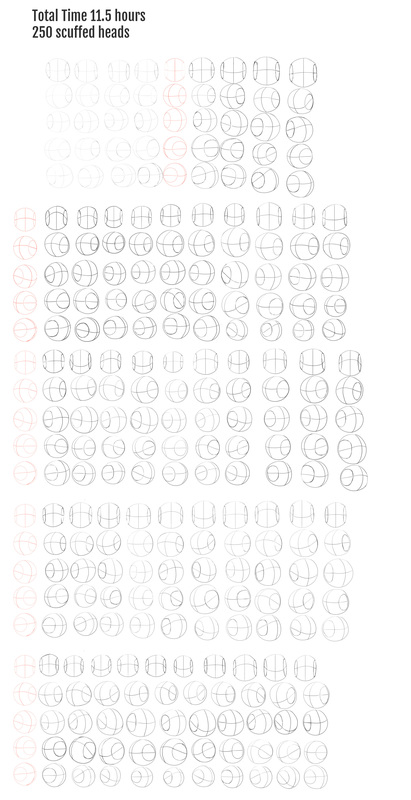 I'm thinking of doing some warmups drawing only circles for 5 minutes each day. I think the ovals for the top red head are way too wide, to me it sort of gives the impression that the face features have to be crammed together. I'm not completely certain of what the ovals represent yet except that they're helpful for specifying head direction. I might learn that later in the video. Until then monkey see monkey do. Red = Used photoshops ellipse tool. Total of 2 hours a day. Yup, sounds like a plan. Can't wait to see your progress. So I'm done with 50 heads looking in various directions. A total of 250 heads. It took 11.5 hours. That means it took, on average, 2.76 min/head. In a perfect world that's a total of 4-5 strokes depending on head direction. In reality I probably redid the headbase / first circle a lot as well as checking the oval size. I spent approximately an hour a day instead of the planned two hours because life got in the way. Conclusion: The heads are in no way perfect and below decent I think. But I got some drawing time in and I'm going to continue with the jaw and the rest lines in the face and try to pay some more attention to detail. It will probably be more interesting to draw something that actually looks like a head. Also the center lines are a bit tricky to nail sometimes. 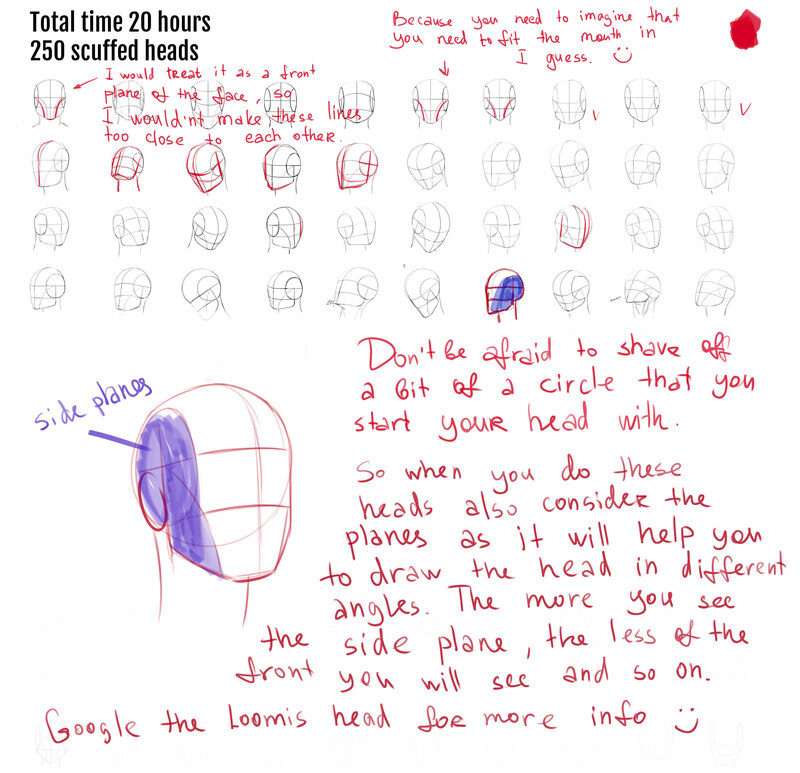 Plan: I'm going to watch the class again to refresh my memory on the jaw and various face lines. I'm probably going for X repetitions again and I don't have anything previously learned to work on so I'll continue to practice drawing circles before doing more heads (now with jaws). I'm currently living and breathing code as one of the last projects at my university are due this sunday so I haven't been able to do 2 hours a day. Things will calm down next week. Until then I try do between .5 - 1 hrs a day. I did do a rough sketch thingy from a scene that popped up in my head and I felt like I just had to put it down on paper before it went away forever. Aside from that I'm still drawing heads. I'm having a hard time with the headshapes. Sometimes I nail it, other times something's off but I'm never sure what it is. I think it has to do with the oval width or rather the center of the face-line along with never perfect circles. I still have 40 heads left to draw until I move forward with my first head feature... I think it's the ears? I'm also not super sure of the chin. Is the chin supposed to be straight-ish or curve parallell to the bottom of the circle? I guess it depends on the perspective? But does it really? Argh. Looking at the image, I think I've failed every head when taking the vertical line into consideration. It's supposed to curve almost identical to the oval, right? But my lines always start out to stiff at the top. Maybe if I draw with the mindset that the line wraps around to the back of the head instead of starting exactly at the top of the circle then it will be easier to draw it. It took longer than expected. I spent, on average, barely an hour a day drawing. But in truth some days I didn't draw at all while I kept other days to a maximum of 2 hours. Stupid life getting in the way Thanks to my setup I can watch movies and stuff on my other screens that makes repetitive work like this a little more "bearable". I think it's time for ears? I'll keep doing heads but I'm not sure how to structure the daily drawing yet. I'm thinking 5 heads a day + when I draw the ears I'll draw the head as well. It's so much easier drawing on a tablet with a thin drawing glove than pulling down my sleeve enough just so my hand can kinda rest on it and consistently glide across the tablet. Also yay, first ear done. 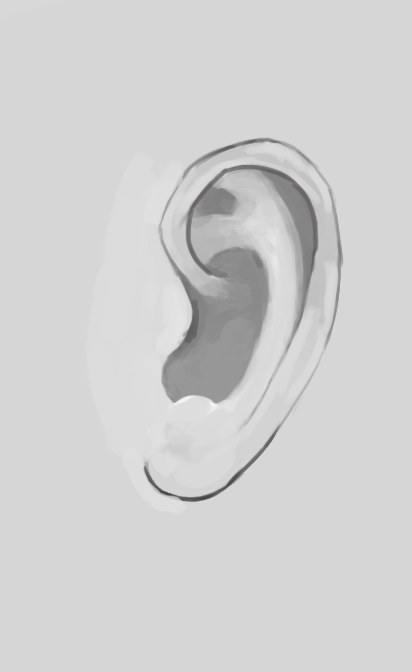 Something looks very off but it's my first ear so I'll cut myself some slack I can't put my finger on it but It's probably the shading. 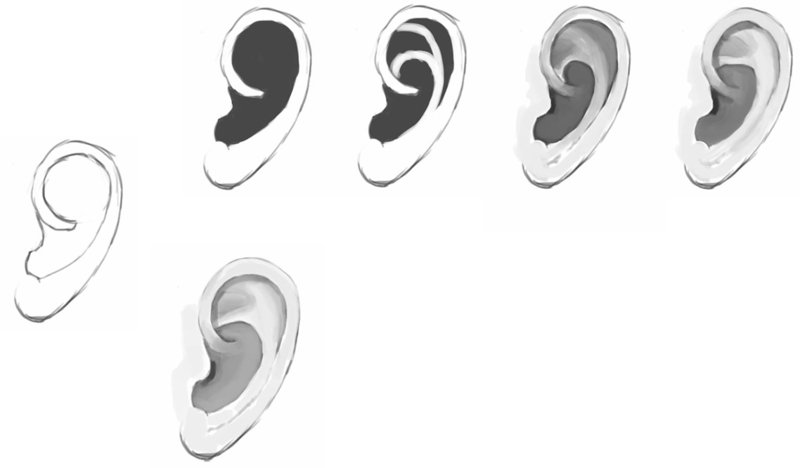 Main focus: 50 ears in 3 different perspectives, alternating between left and right. You are doing great! The more you practice the better you get, keep it up! also i forgot to include..when you wanna draw the the 3\4 view or when you see just a bit of a side plane ... this circle (where you place the ear) it will turn more into the elipse.. I honestly wasn't sure exactly what the "boba fett"-lines was setting up and how to treat them in terms of their proportion to the rest of the face, unless I've missed something I assume Marc will explain that in more detail later (I'm on the ear-part, the first facial feature). I will keep in mind that whole shaving off a bit of the circle, I've definitely been avoiding that for some reason. 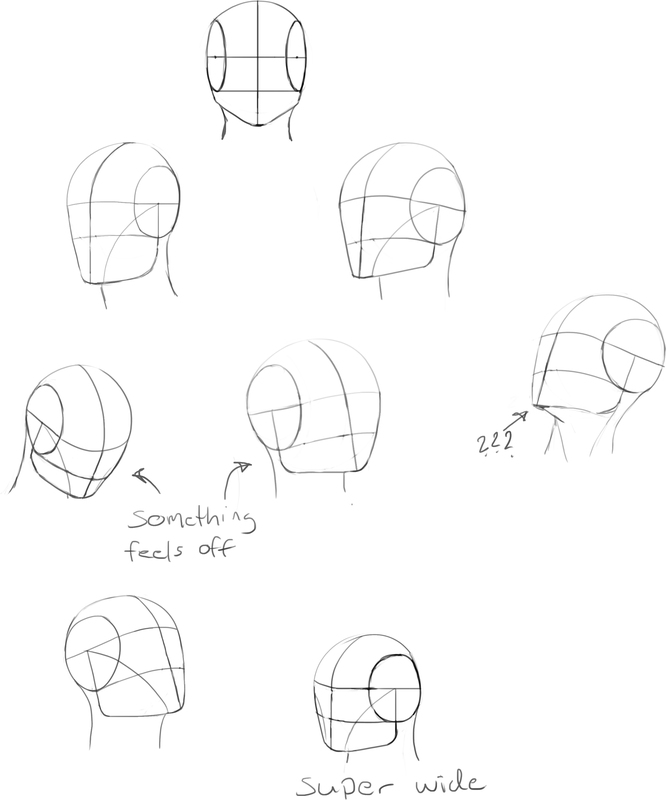 So I'm definitely guilty of just putting out geometry pieces that kinda makes up a head rather than actually trying to construct a head and thinking twice about placement and such. So from now on I'm going to be more mindful of how I'm placing stuff and how it affects the rest of the head. Also, TIL the method Marc teaches has a name. Great stuff, this helped a lot! Thank you so much! I've got a lot IRL stuff to deal with. It's very hectic right now but I'm managing 1.5-2 hours every other day. I think I'll cut down on the number of ears to 25x3. I want to start putting some noses on my heads I've been drawing during the warmpup sessions. PS! The antihelix is driving me insane. I think I'm going to go switch to the first technique Marc showed where you actually draw the Y. Up until now I've been painting the inner ear pitch dark and using the eraser to block out the Y. Your observations seem apt regarding the tilt of the part of the ear you are looking at. The top of the "Y" is also tilted along a similar plane to what you highlighted with red and white. The bottom of the Y comes out further and then curves back in and connects near the base. I think you are on the right path, just keep at it. And grab some photos from other angles to see the 3 dimensional aspects more clearly. Always remember, ears look pretty weird. You are doing fine. Then I did the worst thing possible and googled "ears art" and got pissed off. More trying tomorrow. It's really nice to see how dedicated you are! I think your ear anatomy is on point! 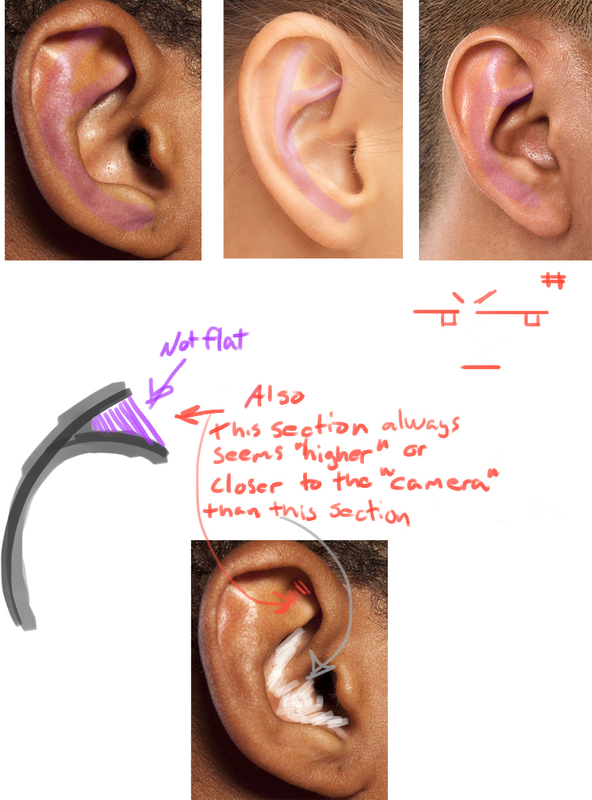 To make the the ear POP more you need to think of how the shape curles and curves when you paint it. Look at the one with the red lines i tried to show what i mean. I'd say that you dont really have much problem with the anatomy itself. Imagine the cube that you need to draw. it has a lighter areas, darker areas etc. In real life on the edge of the light and dark you WONT see a Line. you will see just light and dark colliding together. Same goes to anything else you paint. And more smoother curves will have more colour gradients, slowly transitioning from darker to lighters etc. So when you paint things, try to think of the forms and curves it has and picture them with different values instead of tracing the values with outlines. It is a bit hard to explain like that.. But Marc has more about light and shadow in the future classes so that might be solved in the future. Also when you check out other peoples art you could try and analize how people make things appear more 3d. What edges the object has, what is sharp and what it smooth and why. Yeah! I generally stick to things nowadays mostly because I hate that feeling when you look back and remember like hobbies and stuff you dropped for no good reason and you wonder just how good you would be today if you just stuck to it. But yeah, good that I got the anatomy down at least, point get! I'm already subscribed to istebrak But I haven't actually watched anything yet, so I'm going to give her streams a go while I wait for more art school streams. So what I think I'm going to do is keep trying with the shading and maybe get some black and white painting references to get some idea, but avoid getting like, "stuck", on the ear section just because I can't shade. I want to be able to put some on my heads I've been drawing as warmup every day. I used a soft brush for shading instead of the regular one I'm using. I also put down some rough marks to where the darker areas would be. It's super fuzzy to the point of eye strain. Maybe it'll look better if I use more distinct values (is that the right word)? Either not keep the canvas white or just making the whole ear darker. When I started artschool i was also struggling (was stuck at first terms like for half a year or more) coz i couldnt figure out why it doesnt look the way i want it to look. Answer was simple: proceed to the next terms. I think that Marc had built these terms in this particular way to give us more base information in the beginning and although it has some practice in it, I'd recommend you to not go hard on yourself because there a lot more to learn in the future terms that you can apply to the first assignments etc. And in regards of your last post. Have a darker background for a lighter object that you paint and it goes in reverse: lighter background for a darker object. And your ear without the layer looks quite good! if only I'd add sharper accents to it with a harder brush. Still alive. I'm feeling a little discouraged. I'm still doing a little every day just to keep up/train dexterity. Not actually knowing where shading goes relative to where light hits. I'm impatient. 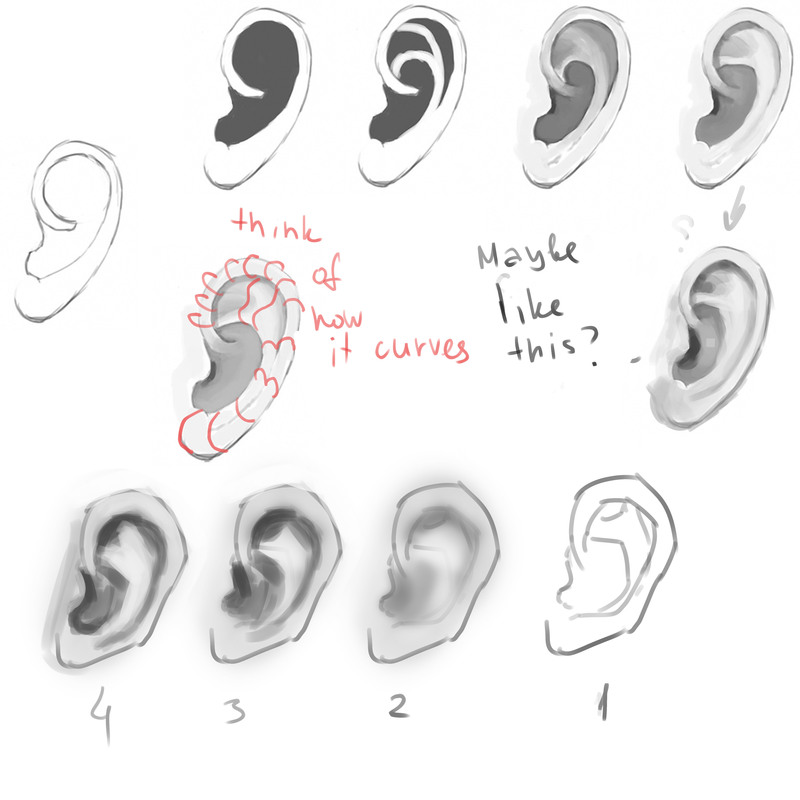 Looking back at all the ears I've done I'm just not paying attention to the 21 references I have in my psd file? These were the last two ears I did. It might sound like I'm giving up but I'm not. I'm planning on spending the summer reading up on shading stuff so I can get a basic understanding of it. During my warmup I always draw a couple of heads with the featured I've learned plus a scuffed nose because why not. I think I'm getting better at drawing heads. But every time I look back at the results I notice some mistakes. I really need to slow down and pay more attention to detail.